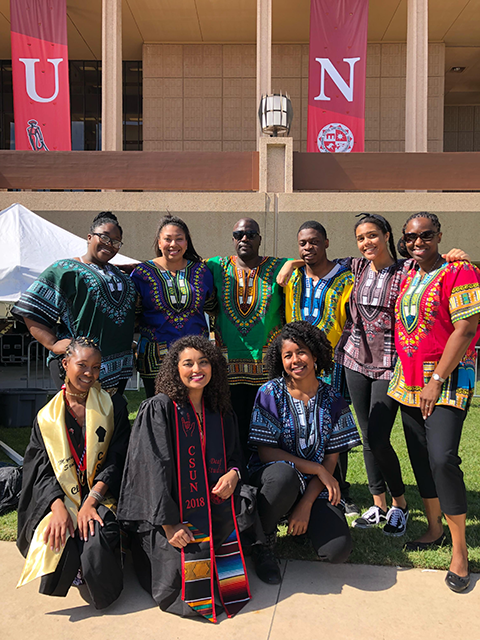 CSUN professor Lissa Stapleton, standing far right, poses with CSUN's Black Signers Group, made up of Deaf and hearing signing students who identify as black, who signed the National Anthem at 2018 Black Graduation Ceremony. Photo courtesy of Lissa Stapleton. California State University, Northridge Deaf studies professor Lissa D. Stapleton has received a $20,000 grant to take Deaf students of color and Deaf studies majors to Cape Town, South Africa. Students from CSUN will compare and contrast the history, language and culture of black, Deaf people in the United States with the history, language and culture of black, Deaf people in South Africa. This past spring, Stapleton wrote a faculty-led international programming grant for the Council on International Educational Exchange (CIEE) that focused on supporting the Deaf community at CSUN. CIEE provides study abroad opportunities for students underrepresented in international education. CSUN is one of two universities that received the grant. CSUN will be going to South Africa and Gallaudet University will be heading to Spain with the grants. The universities were chosen out of 200 submissions for their innovative focus on Deaf and Deaf studies students as well as minority groups, in both historical and regional contexts, according to CIEE. CSUN’s trip will take place for 16 days during the summer of 2019. There will be about 10-12 students attending the trip. The students that are eligible to go are undergraduate and graduate students with a Deaf Studies background or who identify as Deaf or hard of hearing. All participants must be proficient in American Sign Language because of the grant criteria. Students who have never traveled out of the country will be strongly considered. If you are interested in joining professor Stapleton on the trip to South Africa, she will be holding informational sessions regarding the trip this September. Please email lissa.stapleton@csun.edu for an application and any questions.